10-Hour Shifts: Expensive Luxury, or Effective Deployment? Let us assume that a patrol force is authorized 100 patrol officers of 200 total sworn officers. Let us also assume that the agency has an annual turnover rate of ten percent, meaning 20 officers leave the department each year. Agencies should understand the Replacement Cycle concept. In American law enforcement, it is typical to have one year pass from the time an officer leaves the department until he/she is replaced by a trained, capable officer. That year covers the time required for the authorization to hire, the recruiting process, the background investigation, the hiring offer and acceptance, police academy training, and the field training program. Given the above information, of the 200 authorized officer positions, only 90 percent (180) are filled at any one time. This vacancy rate usually produces another undesirable effect. Agencies typically fill their promoted or specialized positions from the pool of patrol officers. Thus, when a captain retires, they are down a patrol officer. When a detective resigns, they are down another patrol officer. If half of the sworn officer positions are for patrol, then the effective turnover rate is double that of the agency. In our example agency, they can expect to have only 80 patrol officers of the 100 authorized positions. For an agency this size to be “up to staff” is practically impossible. This agency should plan their operations around a staff of 80 officers, not 100. Or, they can begin the hiring process before having actual vacancies, preparing themselves for the probable turnover. Long a favorite of shift workers, the 10-hour shift has also frequently been the subject of management complaints about the difficulty of matching on-duty staffing to workload over the 24-hour day and seven-day week. A recent report from the Police Foundation titled The Shift Length Experiment has added new empirical evidence to support the staff preferences, but the challenge remains to justify the schedule. We will answer that challenge here. To cover the 24-hour day with 8-hour shifts, one needs at least three shifts per day starting eight hours apart. Given that workload varies continuously during the day, and given that with this plan the on-duty staffing can change no more than three times per day, then there must be periods of time when the staffing level is either above or below the demand. 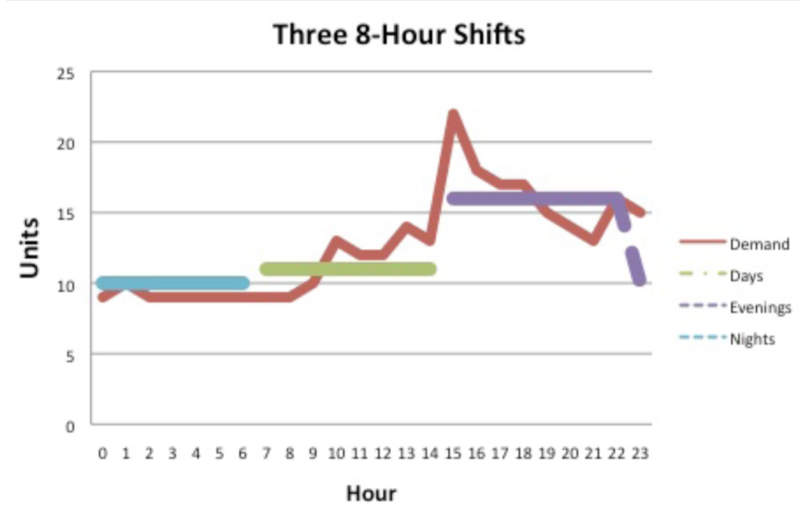 Shown here is a simplified chart of a 24- hour period with three standard 8-hour shifts. Even though the staffing for each shift is optimized to match the demand, there are very few times when the staffing matches the demand. The day shift (0700-1500) is overstaffed at the beginning, then significantly understaffed by the end. The evening shift (1500-2300) is severely understaffed at the beginning but then overstaffed later. The night shift (2300- 0700), like the evening shift, is understaffed at the beginning, and then slightly overstaffed later on. For this demand profile, the apparent resolution would be to add an overlapping, or “cover” shift during the busy periods. However, doing so would not only place more staff than necessary on duty during several hours of that overlap, it would take staff away from other hours when they are needed more. The 10-hour shift offers one resolution to this problem. Because there are at least 30 shift-hours scheduled per day (3 shifts * 10 hours) there are six hours per day to use for overlap(s) during busy times. The six hours of overlap do not have to be consecutive. For example, in the below chart the Day shift works from 0700-1700, the Evening shift works from 1400- 2400, and the night shift works from 2200-0800. This design creates overlaps between 1400-1700 and 2200-2400 which are peak demand periods for this agency. On this chart, note how the total on-duty units closely follow the demand profile improving efficiency and officer safety. A further benefit of the 10-hour plan is that one shift does not end just as the next one begins. Followed strictly on an 8-hour plan there is the strong possibility that no units would be on the street, in their beats, and available to respond to calls that come in at shift change. 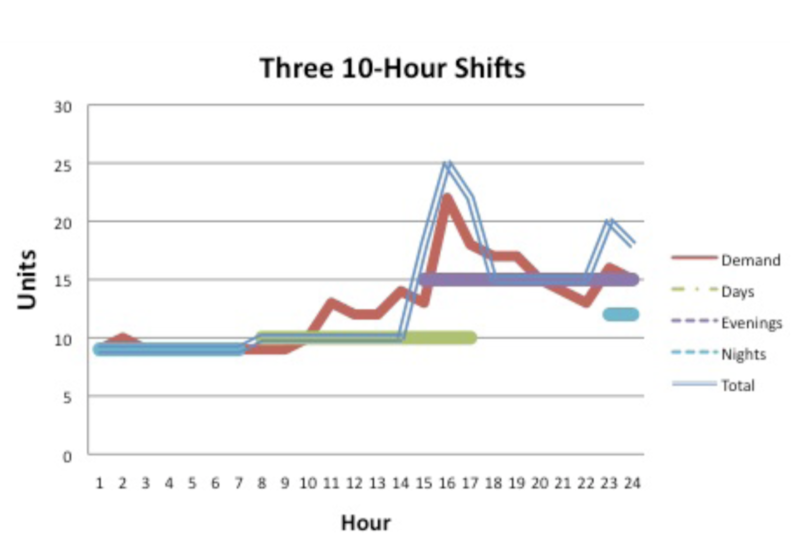 Most 10-hour plans have at least a one-hour overlap as one shift ends and the next begins. This schedule gives the officers time to fuel their cars, return to the station and complete paperwork without incurring overtime and without leaving the beats unstaffed. For the oncoming shift, there is time for a briefing, preparing the vehicle, and driving to the beat, available for calls. Officers working a 10-hour plan work four shifts per week, while those on an 8-hour plan work five. Typically, a police shift begins with a briefing or roll call consuming about 30 minutes before the officer is on the street and ready for calls. There is one hour of breaks during the shift, and then the last 30 minutes are consumed by paperwork and other end-of-shift activities. Altogether two hours out of each shift is lost to active patrol work. For a four-day week, that is eight hours. And for a five-day week, it is ten. The net gain in patrol time is nearly seven percent. That may not sound like much, but consider if you have 100 patrol officers this is the equivalent of adding seven more at no cost. According to the Shift Length Experiment* staff working four 10-hour shifts “averaged significantly more sleep and reported experiencing a better quality of work life than did their peers working 8-hour shifts. And officers working 12- hour shifts experienced greater levels of sleepiness (a subjective measure of fatigue) and lower levels of alertness than those assigned to 8-hour shifts. Importantly, those on 8-hour shifts averaged significantly less sleep per 24-hour period and worked significantly more overtime hours than those on 10- or 12-hour shifts” (abstract p. iv). Having at least a portion of the weekend off is one of the chief interests we find when we work with agencies across North America. For most agencies, Friday and Saturday nights are busy times for police work, so there is a built-in conflict. 10-hour, 4-day schedules tend to make it more likely that each officer will regularly have at least part of the weekend off. Most officers commute to work, and driving four times per week is naturally 20% less costly not only in travel expenses but also in time. Overall, it appears that 10-hour shifts are beneficial to the officers, management and the community. The essential step in implementing and managing a 10-hour plan is the analysis and optimization. 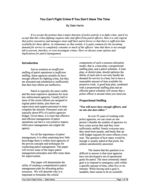 *The Shift Length Experiment, Amendola, Karen L, Police Foundation, 2011. Queueing Theory is the mathematical study of waiting lines, also called queues. 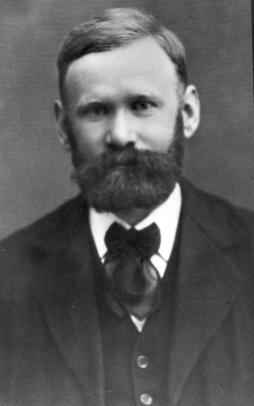 It was first described in the early 1900s by a Danish engineer named Agner Karup Erlang, who worked for the Copenhagen Telephone Exchange. As telephone usage and therefore switchboard demand expanded, staffing the right number of trained operators was a big challenge. It was crucial that the number of operators available aligned with the varying number of incoming calls at all times. When all switchboard operators were busy, any new requests for service would be sent to a queue until an operator was free to connect their call. Erlang developed a mathematical model to project the anticipated wait time for a given number of operators handling a certain number of calls. He identified some key variables to use as inputs, including the number of requests for calls and the amount of time required to connect each of them. This mathematical approach has since been applied to several industries whose business models accommodate variable demand with limited resources. We can see some similarities between switchboard operators and police patrol work. Calls come in from the community, each one taking different amounts of time to resolve. But, there are additional variables required. Patrol officers are mobile and some travel time is needed to respond to different locations. In the 1970s, Dr. Richard Larson from MIT developed computational techniques to adapt the queueing model to police patrol staffing. His work involved expanding the queueing model to project expected travel times while responding to emergencies. With a given number of patrol cars within a known jurisdiction area and street density, one can combine the time required to handle calls with the necessary drive time and project a response time. The New York City Police Department tested Larson's equations and measured an error rate in predicting response time between 1% and 2%. The queuing model along with Dr. Larson's enhancements were incorporated into computer programs written in the 1970s and 1980s, including Hypercube, PCAM (Patrol Car Allocation Model), and Patrol/Plan. Among other variables, the expanded queueing model can project outputs of response times and available proactive time per officer. When arranging the data appropriately, these projections are calculated given the available resources. When those projections are aligned with a planned work schedule, patrol commanders can make informed decisions while assigning officers to teams, areas, or shifts. Our behavior patterns follow a seven-day cycle. Some activities are more common on some days of the week than others. To most efficiently deploy the available patrol officers, staffing rotations should follow the same cycle. However, a 4on/4off schedule does not repeat every seven days and therefore limits the flexibility to adapt to the changing workload between different days of the week. There will be periods where problems will arise due to understaffing while other times of the week are significantly overstaffed. Many schedules have become popular because they allow for different days off each week. This is often favored because officers will rotate through some weekend days off to spend with their families. Every patrol schedule is a balance between ease of management, officer satisfaction, officer safety, and adequate coverage. When choosing something other than a seven-day base rotation for your patrol schedule, be aware that there will be a significant loss in efficiency.